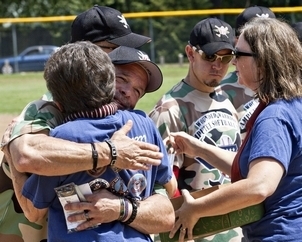 Todd Reed, a member of the Wounded Warriors Amputee Softball Team who was a sergeant first class in the U.S. Army during the Gulf War, receives a hug from Nancy Mast, who together with Deb Tipton (right) are volunteers for the Hugs Project of Elkhart, and who greeted the team members during introductions at a charity slow pitch softball game between the Wounded Warriors and Goshen firefighters Saturday afternoon in Shanklin Park. The Hugs Project makes Hugs- a cooling tie that will keep a serviceperson cool for hours in the blistering heat of the Middle Eastern desert. It is made of sand-colored cotton (for camouflage) and filled with polymer crystals, which absorb moisture and swell when immersed in cold water. GOSHEN — Greg Campbell approached the dugout with his son, Luke, in tow. He talked to the coach, who nodded, and looked back at his son. “You’re going to hang out with these guys for a while,” he told Luke, and left him to mingle with the 15 members of the Wounded Warrior Amputee Softball Team. Moments later, the team was embracing Luke like one of their own. And, in a sense, he was. Like each member of the team, Luke, who turns 15 next week, was missing a limb. Luke was born without his left arm, while the veterans lost arms or legs in overseas combat. Just like the Wounded Warriors, Luke has a passion for the sport and is the pitcher for his travel baseball team back home. The Campbells drove 200 miles from Trenton, Ohio, to see the Wounded Warriors play an exhibition game against the Goshen Fire Department on Saturday afternoon. They play again at 7:30 p.m. today, July 21, at Central High School’s softball complex and will take part in the Elkhart County 4-H Fair Parade on Sunday, followed by a meet and greet at the fairgrounds. Luke, Greg, the Warriors’ friends and family and hundreds of others from the community gathered around a diamond at Shanklin Park to support both teams. The Wounded Warriors were greeted by cheers and embraces as women from the HUGS Project of Elkhart gave each member of the team homemade “hugs.” After the game, the team exchanged handshakes with other veterans in attendance and signed autographs for the fans. Luke watched in awe as the Warriors flew around the field. Players with one arm repeatedly slammed the ball into the outfield. Players with prosthetic legs streaked across the grass to pull down a pop fly. They weren’t just good; they were pretty great. Midway through the game, the Warriors turned to Luke and asked him if he wanted to bat. Stunned, Luke said yes, slipped on a Wounded Warriors jersey and walked up to home plate. His swing connected with the ball on the first pitch, though it flew into the mitt of a Goshen firefighter at second base. Luke started heading back to his seat in the bleachers when one of the Wounded Warriors stopped him. Luke spent the rest of the game in the dugout, exchanging fielding advice with other one-armed players like himself. At the end of the game, which the Wounded Warriors won 19-0, they all signed a softball for Luke and gave him a silicon camouflage bracelet. “It says, ‘Life without a limb is limitless,’” Luke read, sporting the bracelet on his wrist. People like Luke are part of the reason the Wounded Warriors travel the country to play in these exhibition softball games, said team member Kyle Earl of Kalamazoo, Mich.
Earl lost his right hand after he was injured by an improvised explosive device in Iraq in 2006. He said while the team has been a source of therapy after his amputation, he also plays to give people like Luke hope. “That’s why we do this,” Earl said. “To have guys that are missing a body part come out and to be able to see that it’s not the end. If you work hard enough, you can get out there and play with anybody, anywhere, anytime.